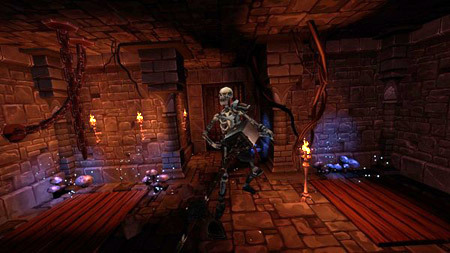 KryptCrawler is a grid-based first person Dungeon Crawler game for PC and VR by CrazyBunch. Descend into the unknown and explore the perilous depth of the sinister tombs and crypts you are thrown into, armed with nothing but a map and your wits. Find powerful weapons and wield mighty artifacts to fight off the undead remains of the warriors who have come here before you. Defend yourself against poisonous scorpions, hungry spiders and other creatures of the dark. Survive vicious traps and solve challenging puzzles, many tests will await you deep down in the crypt, getting more deadly the further you descend into the catacombs. All over the dungeon there are powerful weapons and treasures to discover. Some will help you fight ferocious enemies some will even let you unveil new paths deeper into the crypt. Fight, puzzle and explore through 10 giant story levels and unveil an ancient secret which lies hidden deep inside the crypt. If you get stuck in the game, check out the video walkthrough and gameplay for the game. This entry was posted in PC Games, Walkthrough and tagged KryptCrawler Cheats, KryptCrawler Game, KryptCrawler Gameplay, KryptCrawler Guide, KryptCrawler Hints, KryptCrawler Review, KryptCrawler Solutions, KryptCrawler Strategy, KryptCrawler Tips, KryptCrawler Walkthrough by Marvin. Bookmark the permalink.